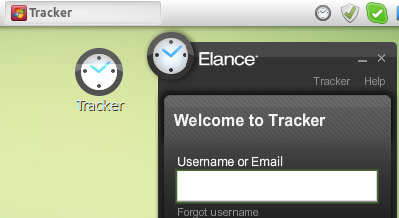 Elance Tracker app uses Adobe Air and as Adobe has stopped Air support for Linux (the latest supported version is 2.6) - it became problematic to run Air apps on Linux. You can find a lot of manual allover the Web how to solve different issues and install Air on Linux (like linking libgnome-keyring.so etc. ), but with Ubuntu each new version brings less compatibility. On Ubuntu 13.10 for a long time I was not able to install Adobe Air in any way. Only one manual from tkalin.com helped me to figure it out. My previous manual using Wine was not correct. Sorry for that, with Wine you can install and run Tracker, but time and screenshots are not being tracked. So it is useless.